al-Ka’bi, Nasir. 2015. 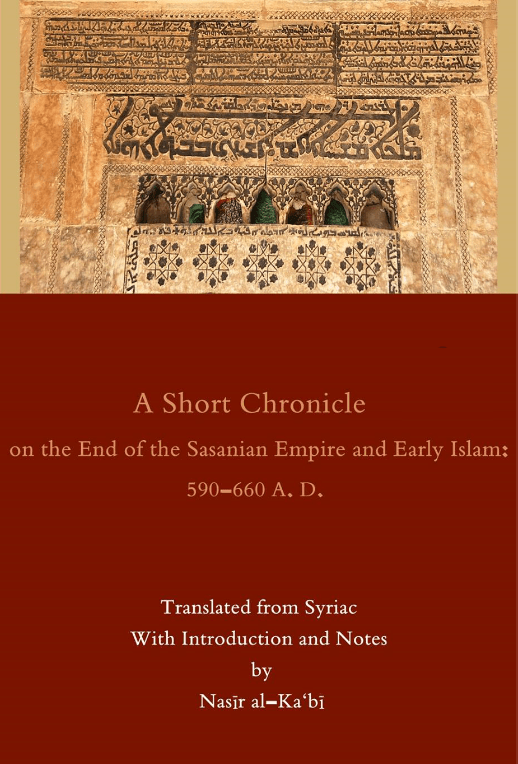 A Short Chronicle on the End of the Sasanian Empire and Early Islam. New Jersey: Gorgias Press. The Short Chronicle is probably part of a Church History that is no longer extant, and it was written by an Ecclesiastic living in the north of Mesopotamia and belonging to the Church of the East. It is an eyewitness report on a crucial historical period, the mid-7th century that witnessed the demise of two contending world empires, the Sasanian and the Byzantine, and their replacement by Islam, thus signaling the end of Late Antiquity and the beginning of the Middle Ages. The Chronicle may be the earliest Syriac document which relies heavily on official Sasanian sources, including Khwaday-namag, when it discusses secular history, and on church histories when dealing with ecclesiastical matters. It may also be the oldest Syriac chronicle which deals with the advent of Mu?ammad and the ensuing Arab conquest, and which mentions Arab cities for the first time ever, including Mosul, Kufa, and Basra.